An interesting debut offering that brings the world of horses and show jumping to the forefront, Anne Clermont has created a story sure to be favorites of every person who dreamed of, or actually knew a horse personally. Brynn honors her passion for horses by studying at the toughest veterinary program in the country. Months from graduating, tragedy strikes―tragedy for which she can’t help but feel responsible. Brynn feels suffocated by the weight of her father’s legacy and his dusty hopes for horse show jumping success. When Brynn’s frenetic efforts to dig the family business out of debt fail, she’s down to one desperate hope. Enter Jason Lander, who understands what it’s like to walk away from the ring. The onetime champion agrees to train Brynn, and her horse Jett, for an all-or-nothing run at the prestigious Million Dollar Gold Cup. But going all the way means doing it his way, which has Brynn questioning her decisions, her loyalties, and her growing feelings for Jason―complicating her relationship with her lover. 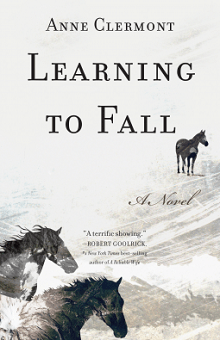 Set in Northern California against a stunning backdrop of coastal hills and valleys, Learning to Fall is about discovering how to let go―and how to hang on with your heart. Anne Clermont, born in Kraków and raised outside of Toronto, spent fifteen years in California before relocating to the beautiful Pacific Northwest. She holds a BS in animal biology, and an MBA. Her background ranges from studying animal behavior to carrying out pancreatic cancer research at one of the world’s largest and most innovative biotech companies. Inspired to write Learning to Fall in part by her own experience of running a show jumping business, she now devotes her time to writing and working as a developmental editor. She lives on an island in the middle of Puget Sound with her husband and two children.